Fueled by hatred and jealousy, Lex Luthor masterminds an elaborate plot to kill the Man of Steel —  and it works. Poisoned by solar radiation, Superman is dying. With weeks to live, he fulfills his life’s dreams —  especially revealing his true identity to Lois Lane —  until Luthor proclaims his ultimate plan to control the world with no alien hero to stop him. Powers fading, Superman engages in a spectacular deadly battle with Luthor that could truly trigger the end of Earth’s Greatest Protector. 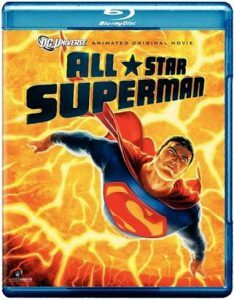 This startling and gripping DC Universe Animated Original Movie stars the voice talents of James Denton, Anthony LaPaglia, Christina Hendricks and Ed Asner. Steve Lombard: — Superman Saves Mission To The Sun — ? We don’t know that yet, Lois. Lois Lane (Christina Hendricks): I already write Superman stories before they happen. If you don’t know how big the sun is, go away. Jimmy Olsen: It’s 333,000 times bigger than the size of the Earth. I looked it up on my Superman signal watch. Dr. Leo Quintum: Your trip to the sun overexposed your cells to solar radiation more than even your body can metabolize. Superman (James Denton): I see it, like tiny fireworks beneath my skin. Dr. Leo Quintum: Your cells are over-saturated with power. Their bursting from within. Superman (James Denton): I’m dying. Dr. Leo Quintum: I — ’m sorry, Superman. If I hadn’t tried to steal fire from the sun, none of this would have happened. Superman (James Denton): Don’t apologize. You couldn’t have known. Dr. Leo Quintum: But he knew. It was his plan all along. Luthor used me to kill you. Clark Kent (James Denton): Why, thanks, Lois. I don’t know where my self-esteem would be without you. Lois Lane (Christina Hendricks): Alone, in front of the TV. Lois Lane (Christina Hendricks): That key can’t be safe. Superman (James Denton): Why don’t you give it a try? Superman (James Denton): I carved it out of a piece of dwarf star material. It weighs half a million tons. Lois Lane (Christina Hendricks): So you’re the only one who can lift it. Superman (James Denton): I work pretty hard, Lois. Lois Lane (Christina Hendricks): It all makes sense now. He’s brought me here to be the mother of a race of super-children. Can’t let that happen. They’ll grow up and lie to everybody. Superman (James Denton): You stole that necklace. Atlas: Don’t you see? We couldn’t fight the Ultra-Sphinx without help, so we let it chase us here. Samson: But we meant no harm to Lois, I swear to living Zeus. Superman (James Denton): And I swear too. If she dies, you’re both going to the Phantom Zone. Ultra-Sphinx, let’s hear it. Ultra-Sphinx: Question: What happens when the irresistible force meets the meets the immovable object? Superman (James Denton): They surrender. Atlas: Wait a minute, what about our contest? Answering a riddle is hardly what I’d call a feat of strength. Samson: I agree. How about I wrestle you for her? Or is the mighty Man of Steel a coward? Atlas: Even the shield on his chest is yellow. Superman (James Denton): Then we have a deal? If I win, you both leave the 21st century right now. Atlas: I’ll be leaving, all right, with the beauteous Lois Lane on my arm. Samson: Not if I beat him first. Superman (James Denton): I’m sorry, have you two already started? Lois Lane (Christina Hendricks): My birthday gift’s wearing off. I can’t see radio waves anymore. I can’t hear the stars singing. I’m tired and sore all over, like I’ve been dancing all night. Thanks for letting me spend a day in your world. Superman (James Denton): You know, I do other things. I mean, besides being Superman. Lois Lane (Christina Hendricks): You do a great Clark Kent impersonation. You almost had me fooled. Wait till I tell him about this. Clark Kent (James Denton): Gotta get away from him. Lex Luthor (Anthony LaPaglia): What’s the matter, Kent? Afraid he’ll absorb your cowardice? Lex Luthor (Anthony LaPaglia): You know what happens when you take on Lex Luthor? The same thing that’s gonna happen to Superman. Clark Kent (James Denton): It’s such a waste. You and Superman could have been friends and instead you’re going to die. Lex Luthor (Anthony LaPaglia): Ah, but he’ll die first. Superman (James Denton): You just moved into my fortress? Lilo: Shouldn’t have left the key lying around. Steve Lombard: I missed you, Kent. You’re comedy gold. Steve Lombard: [to Lilo] I’m loaded with dignity. I can see how you’d make the mistake but, despite this great bod, I’m not Superman. Bar-El: After everything we’ve done, you still show us kindness. Superman (James Denton): My Earth parents taught me forgiveness. Humanity has a lot to teach us. Bar-El: Perhaps. Kal-El, son of Krypton, I’m proud to call you my kin. Our greatness lives on in you. Superman (James Denton): We don’t have much time. Bar-El: There’s a way to save us both. Surely you’ve thought through it. Superman (James Denton): Yes. But it has to be your choice. I’ll try to find a way to cure you. Bar-El: But your own time is short. Do what you must. Send us to the Phantom Zone. Nasthalthia: Cool. When do I get my super-powers? Lex Luthor (Anthony LaPaglia): The same day that I can trust you with the car keys. Solaris: Impossible, I made your sun red. You should have no powers. I see now. Your covering protects you from red sunlight. But it cannot survive this heat. Superman (James Denton): It should work long enough for me to take care of you. Solaris: No, your sun is dying, but I kill you first. Superman (James Denton): Stop this. Whatever Luthor offered you, he’ll betray you. Solaris: I betray Luthor first. I will eat your sun, and replace it in the sky. Your people will pray to me, or die in the cold dark. Nasthalthia: Give me one good reason I shouldn’t vaporize you. Jimmy Olsen: The front-page story we’re gonna write about you for tomorrow’s Daily Planet? Lex Luthor (Anthony LaPaglia): Did you ever think that it would end like this? Me looking down on you? Superman (James Denton): Actually, I had the whole thing figured to end pretty much exactly like this. Lex Luthor (Anthony LaPaglia): Better than okay. I can see the entire electromagnetic spectrum and those must be atoms, little clouds of possibility. Einstein couldn’t connect the gravitational force to the other three, but if he could have seen this! It’s so obvious. Lex Luthor (Anthony LaPaglia): The fundamental forces are yoked by consciousness. Everything’s connected. Everyone. And this how he sees things all the time. Every day. Nasthalthia: I don’t know if I should be worried or mortified. Lex Luthor (Anthony LaPaglia): It’s a cruel joke. The mechanistic clockwork of reality hinging on a precious impossible defiance of entropy, on life. And the clockwork doesn’t care. It’s like – Like it’s all just us, in here together. We’re all we’ve got. Nasthalthia: You are embarrassing me beyond therapy. Superman (James Denton): You’ll have to forgive him, Nasthalthia. He just figured out how everything works. Lex Luthor (Anthony LaPaglia): Give it back. I saw everything. I saw how to save the world. I could have made everyone see. If it wasn’t for you, I could have saved the world. Superman (James Denton): If it had mattered to you, Luthor, you could have saved the world years ago. Lex Luthor (Anthony LaPaglia): You’re right. Lois Lane (Christina Hendricks): Oh, your poor face. Superman (James Denton): No one can repair the sun but me, Lois. I’m turning into pure energy and I only have one chance to save the world. Lois Lane (Christina Hendricks): That’s all you’ve ever needed. Superman (James Denton): I love you, Lois Lane, until the end of time. Jimmy Olsen: Are you sure don’t want to speak at the memorial service? Thousands of people are there paying their respects. Lois Lane (Christina Hendricks): He’s not dead. He’s up there fixing the sun. And when he’s done, he’ll be back. And I’ll be here waiting for him. Lex Luthor (Anthony LaPaglia): Doomed planet. Desperate scientists. Last hope. Kindly couple. Superman. Lex Luthor (Anthony LaPaglia): I’d already be free. No, I’ve already accepted my imminent execution. This is a confession. Forgive me, doctor. For have I sinned. A lot. Dr. Leo Quintum: You killed him. Lex Luthor (Anthony LaPaglia): And my deathbed claims that I’ve seen the error of my ways can’t change that. But there is one thing I can do to honor his memory.